Today only you can get this Crocnfrog 2-in-1 Shopping Cart or High Chair Cover on sale for $17.58 (Retail $37). -2-in-1 Cover. Shopping Cart Cover for baby. High Chair Cover. Premium Quality Polyester fabric with polka dot design.Fits medium/standard carts like Walmart. For larger Target and Costco carts, please check out Crocnfrog 2-in-1 Shopping Cart Cover | Large Size (Owl Design). -Cover is comfortable with silky soft fabric. 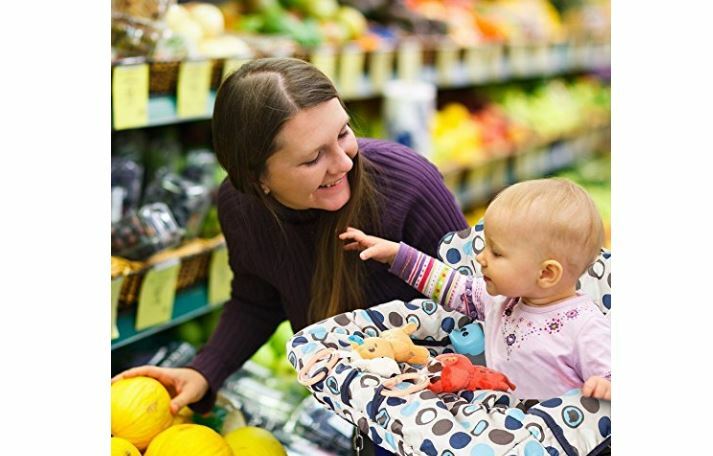 Keep baby protected from germs and crud generally found on the grocery carts and restaurant chairs. -Fold it into an easy to carry a pouch in less than a minute . Cover unfolds on cart with pouch becoming storage space. -3 Toy loops keep baby engaged with his or her favorite toys.